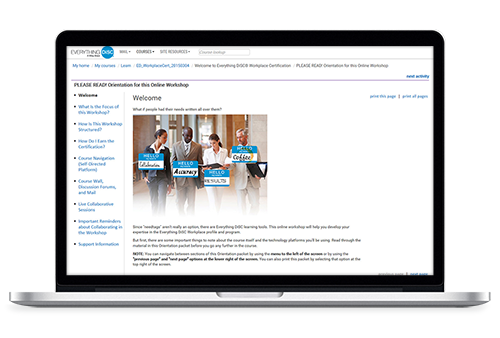 Accessible anytime, from the privacy of the learner's home or office computer, Everything DiSC® Workplace Certification is the best resource to gain foundational knowledge and invaluable tools for facilitating Everything DiSC®. Designed with busy schedules in mind, this online learning certification course gives learners the flexibility of self-paced learning, paired with live-collaborative sessions led by expert trainers. With a primary purpose to increase confidence and competence in delivering Everything DiSC Workplace, this course offers rigorous new content on the principles of the DiSC model and the supporting research. During the live sessions, learners complete activities designed to give practice facilitating with small groups and explore challenging scenarios that could come up during workshops. Learners will also learn how to keep Everything DiSC alive within the organization by creating a culture of DiSC and be introduced to MyEverythingDiSC, our mobile-friendly, interactive learning portal that is exclusive to Everything DiSC. Learn to keep Everything DiSC alive within the organization by creating a culture of DiSC with MyEverythingDiSC. Please contact Training Solutions, Inc. to register for an Everything DiSC® Workplace Certification program. Call 703.318.0838 or email customerservice@trainingsolutions.com. We will give you personalized service and will take care of the registration details for you. You will pay the required $2495 registration fee directly to Training Solutions. Classes are limited to 20 people and sell out quickly so register as soon as you can.